Despite the ongoing production decline, the volume of domestic machinery exports grew markedly, according to the results of five months of this year. The Chairman of the Committee of industrial development and industrial safety Timur Nurashev told us about the current state of the strategic industry. Timur Bekbulatovich, how domestic engineering industry develops today? The turbulence of the global economy continues to negatively affect the situation in Kazakhstan, and engineering is no exception. The volume of industry’s production in January-July of this year amounted to 284.5 bln KZT. While the index volume (IV) dropped to 75.7%. In the meantime, labour productivity in the manufacturing industry increased by 17.7% compared to the same period last year and reached $5.1 thous. per employee. As of July 1st, 3,342 engineering enterprises are registered in Kazakhstan, 2,322 of which are operating. The number of people employed in the industry in the first three months of this year reached 79.5 thous. man. Despite the crisis tendencies, a positive dynamics in exports of the domestic mechanical engineering products is observed. For the first five months of this year it has increased to $244.2 million, which is 34% higher than a year earlier. At the same time, the volume of imports decreased by 16% to $283.9 million. If we are talking about investments in basic capital of engineering enterprises, for the first half of this year its volume amounted to 14.3 bln KZT, decreasing by 0.5%. What is the situation in individual segments of the engineering industry? In the context of the priority sectors in the first half of the year, the volume of motor vehicles production totalled 23,107.8 mln KZT, IV - 41.2% The largest decline was observed in the segment of the passengers cars by 62.2% - to 2,983 units, and buses by 23.7% - to 71 units. But positive changes are recorded in the production of trucks. Growth here reached 16.6%, up to 718 units. As a reminder: according to the results of the first five-year plan it is automotive engineering that showed record results. Thus, in 2014 motor vehicles volume of production compared with 2010 increased 12 times, and the share of the sector in the total volume of engineering industry reached 22%. Despite the decline observed since last year, now the situation has stabilized, and we expect the increase in production summarizing the results of the current year. The share of domestic cars in total volume of sold vehicles should rise from 20% to 30%. Railroad engineering production showed positive results. Output in this sector reached 13,613 mln KZT, and IV - 101,5%. Growth was observed in the segment of freight wagons by 58% (79 units) and locomotives (3 units). The volume of electrical equipment production amounted to 48,881.3 mln KZT with volume index equal to 96.1%. In particular, there was a decrease in production of transformers (by 20.1% - down to 5,107 units), high voltage equipment (by 9.6% - down to 2,726 units) and wires (by 10.3% - down to 175,009 thous. meters). However, battery production increased 2.1 times up to 638,957 units, fiber optic cables - 1.6 times, condensers by 73.4% - up to 4,215 units, radiators and boilers by 8.9% and lighting equipment by 22.8% - up to 221 units. There is growth in equipment for the petroleum and petroleum refining industry by 12.2% - up to 16,289.5 mln KZT. In particular, the manufacture of hydraulic equipment increased 4.6 times, pumps and compressors by 7.1%, taps and valves by 20.8%. Agricultural engineering dropped to 7,790.3 mln KZT with IV of 54.9%. The decline recorded in the production of reapers (by 23.8% - down to 96 units) and combine harvesters (-84.9% - down to 41 units). At the same time, the number of tractors increased by 7.2% - up to 715 units. With regard to the manufacture of machinery and equipment for the mining industry, its volume amounted to 14,249.5 mln KZT with IV of 72.5%. If production of underground operations equipment decreased by 63.5%, the metallurgy equipment, on the contrary, increased by 2.8%. Which products of Kazakhstan engineering is in the highest demand and what is its market share? Products of railway machinery remain the most popular - equipment and devices for rail tracks (turnouts, reinforced concrete piles), parts of the rolling stock (bearings, trucks and brakes), as well as finished products (cars, locomotives and electric locomotives). It is not surprising that based on the results of 2015 it occupies the largest share in its segment - 54% with total market capacity equalling to $449.1 mln. On the second place are Kazakhstani producers of agriculture equipment. They cover 19% of the needs of our agriculture, which is $512.2 million. Then come the enterprises for the production of electrical equipment is 16% of $2,468.6 mln, the auto industry is 15% of $2,235 million, and mining and metallurgical engineering is 12% of $1,173.8 mln. Most of all, we are dependent on imports of oil and gas equipment, our mechanical engineers cover only 10% of the market while its total capacity is $1,510.4 mln. It should be noted that most engineering products in Kazakhstan comes from China, United States, Germany and Italy, which last year generated more than 50% of the total imports. With China accounting for almost a third of its volume. With regard to our engineers foreign trade, today their products are supplied to more than 90 countries of the world. In the first five months of this year, the bulk of our exports fell on rechargeable batteries - 5%, bearings - 5.1%, diesel-electric locomotives - 2.1%, liquids filtering or purifying equipment - 1.2%, pipe fittings, boilers, reservoirs, tanks, storage reservoirs or similar containers - 2.5%, liquid pumps - 1% and transformers - 0.8. In the future we hope to develop exports of vehicles of domestic manufacture. Deliveries have already been initiated to Mongolia, Turkmenistan, Kyrgyzstan, the Russian Federation and preparations to develop markets in Tajikistan, Uzbekistan and Azerbaijan are being made. Which engineering projects were implemented lately? Under the second SPIID five year plan 10 machine engineering productions were launched last year, with total cost of 24,262 mln KZT and 1,052 jobs created. Among them are the two significant and large projects. The first one is the organization of agricultural, shipping and municipal equipment, which was implemented by Machine Building Plant KAZTECHMASH LLP together with foreign investors represented by Finnish Sampo and Polish Pronar Sp. z o.o. The cost of the project amounted to 1,915 mln KZT. The second project is the tractor producing enterprise of Kaz Kioti LLP in cooperation with the Korean Daedong, in construction of which 11,700 mln KZT was invested. The volume of output in these enterprises has already reached 3,594 mln KZT. This year, when reaching the planned capacities it is expected to increase the production 3.5 times up to 12,868 mln KZT. Another four projects totalling 5,101 mln KZT were put into operation this year. This has created 374 jobs. Of course, the machine engineering enterprises, established within the framework of the Map of industrialization, made a significant contribution to the country's economy. Just last year they produced goods amounting to 110.4 bln KZT, that 71.2% higher than the indicators of 2012. With new projects accounted for 16.7% of total production of machine engineering industry of Kazakhstan. With regard to the current year, during January-June the enterprises of the Map of industrialization released engineering goods worth 38.5 bln KZT. Also I want to mention that launching new projects gives a multiplicative effect on the development of related industries, the infrastructure of the region improves significantly, welfare of the population is increasing, business climate is becoming better. What role in enhancing the competitiveness plays cooperation of our engineering enterprises with the world leaders of the industry? In the framework of the implementation of the first five-year plan the main goal was to create a major assembly plants in Kazakhstan. As a result, the world leaders such as General Electric, Alstom, Talgo, LG, Chevron, Hyundai and other companies were brought into the industry. Cooperation with them will allow domestic enterprises to incorporate into global value chains, increase the competence and develop new markets, become competitive at the world level. The most successful examples of cooperation include the project on assembly of the main-line diesel locomotives under the license from General Electric on the basis of Lokomotiv Kurastyru Zauyty plant. The design capacity of the enterprise, in which 16.6 bln KZT was invested, equals to 100 locomotives per year. Starting from 2010, more than 300 locomotives were assembled at the plant, and the products are delivered not only to the domestic market, but also successfully exported in Azerbaijan and Ukraine. In order to increase the level of localization, Lokomotiv Kurastyru Zauyty and General Electric launched a production of diesel GEVO engines in Astana last year. Total investments in the project amounted to $60 million. In the first phase the Astana Diesel Service plant will produce 100 engines per year, and that figure should grow to 200. And in the near future up to 10% of the production is planned to be exported to Russia and Central Asian countries. What prospects for engineering opens membership of Kazakhstan in the EEU and WTO? One of the most important and real opportunities for industry in modern conditions is cooperation between the enterprises of the countries participating in the EEU. This will help increase the production and export of products, expand sources of attraction of investments and introduction of new technologies. For example, recently the production of road and rail assets has developed in Kazakhstan, including at the joint with Belorussian and Russian companies enterprises, which are supplying products to the common market. Thus, Azia Avto JSC manufactures Russian VAZ automobiles in Ust-Kamenogorsk. A joint Kazakh-Russian plant KAMAZ Engineering JSC in Kokshetau produces KAMAZ automobiles of model line-up. Based in Kostanay Agromash Holding together with Belorussian partners produces various agricultural machinery. Since the establishment of a single customs territory access to new markets opened for our country. This allows to improve the financial climate in the country and increase investment in the industry, both domestic and foreign. There are many advantages of Kazakhstan joining the WTO: non-discriminatory approach at the foreign markets, transparency, a favourable climate for investment and trade. However, now we have limitations on the amount and types of Government support provided to the industries that are in priority for us. In this regard, within the updated Industrial-Innovative Development Programme the Government support system of the industry support is being reviewed, to avoid reducing the competitiveness of domestic enterprises and maintain export with rules not prohibited by the WTO and EEU. What incentive mechanisms are most effective for the development of mechanical engineering? To date, there are a number of instruments of State support for business, including the enterprises of engineering industry. As is well known, the main problems in the development of production remains a lack of circulating assets, imperfect equipment and shortage of qualified staff. Supportive measures are assigned in order to solve them, included in such programs as Business Road Map-2020, Damu-Ondiris and Performance-2020. These include subsidized interest rate on the loan and leasing, financing of entrepreneurs through given investment of funds in banks and leasing companies, financing of investment projects and export operations, grants on technological development, tax preferences and investment subsidies. Also the assistance in the entry to the export markets is provided. Effective mechanisms to support industry remain measures aimed at crediting and subsidizing the consumers of engineering products. Thus, last year the program of preferential car loans and lease financing was launched, having a significant positive effect. Every third car of Kazakhstan production was acquired through concessional lending, which benefited a total of almost 7 thous. people. The Life Cycle Contracts are well-proven in the Russian engineering. Is this experience can be applied in Kazakhstan? The Life Cycle Contracts (LCC) are primarily the instrument of public-private partnership. As such, they have already proven their effectiveness in foreign countries, because they allow you to find a supplier that will be on a long-term basis to carry out all cycle of works from design to operation. Of course, such a tool can be applied in Kazakhstan. In the framework of the implementation of the second SPIID five year plan it is scheduled to adopt a new law on PPP, which will create new opportunities for investors. Moreover, Kazakhstani companies are already engaged in providing such service. So, for example Agromash Holding JSC - the largest domestic manufacturer of agricultural machinery, opened the largest service and sales network based on the needs of farmers of Kazakhstan. It has 8 branches and 11 offices in all main grain-producing regions of the country. These centres are not only selling machinery, but also carry out the warranty maintenance. How the acute shortage of professional personnel can be solved? Indeed, currently there is a shortage of skilled labour in the engineering sector. It is only possible to cope with this problem through the improvement of the training system and educational programs, improvement of material and technical basis of the higher educational institutions and organizations of technical and vocational education (VET). The reform will be carried out at the expense of the local budgets and through the implementation of trust management mechanism in VET organizations. The effectiveness of training will be provided through a number of measures. Firstly, through targeted education, i.e. training of students with simultaneous professional practice at the specific enterprises. Secondly, it is intended to develop educational programmes on the basis of professional standards, which involves students obtaining key competences. Thirdly, enterprises themselves will give an expert evaluation of the quality of educational programs and curricula. Fourthly, we plan to actively engage the experienced producers in the educational process. Finally, opportunities will be created for the introduction of advanced scientific results in the activities of the enterprises by the way of Research and Advanced Development re-orientation on specific technological tasks, carried out by the basic institutions. The results of such research will be included in the content of subjects taught. In addition, as I mentioned above, within the framework of Performance-2020 Program, the Government is willing to undertake the part of enterprises’ costs on preparation and improvement of the professional skills of the staff. Born October 24, 1974 in Almaty. In 1996 he graduated from Kazakh State Architectural-Construction Academy, as Engineer-Economist. In 1995-1997 worked as a Chief Specialist, Deputy Director General of the research-and-production association Almakom. In 1998-2002 - Leading Specials of the Department of coordination of external assistance of the Agency for strategic planning and reform. From 2002 to 2004 - Deputy Director, Director of the Department for strategic planning and investment policy of the Ministry of Economy and Budget Planning. In 2004-2010 - Deputy Chairman, Chairman of the Investment Committee of the Ministry of Industry and Trade of Kazakhstan. In 2010-2014 - Director General of the National Center of Accreditation JSC of the Committee for technical regulation and metrology of the Ministry of Industry and New Technology of Kazakhstan. 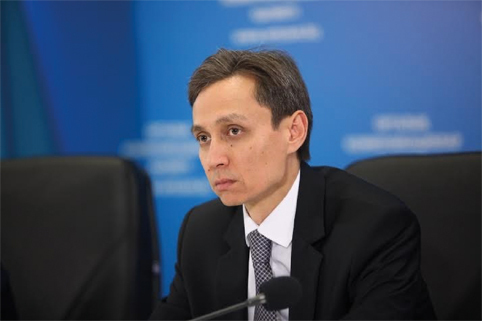 Since August 2015 - Deputy Chairman, Acting Chairman of the Committee for industrial development and industrial safety of the Ministry of Investment and Development of Kazakhstan.